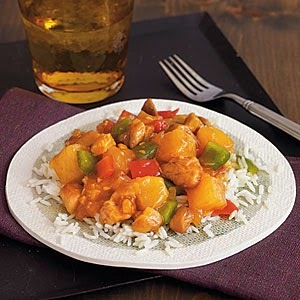 Sweet and sour chicken is aptly named--brown sugar and ketchup deliver the sweetness, vinegar and soy sauce give that sour punch, and orange and pineapple juices provide a tangy twist. While it does tingle the taste buds detecting both, the resulting dish in this particular case is a bit more sweet than sour (like some people)(hopefully myself included). Adjust accordingly if supremely sour is more your speed. This recipe comes from an outstanding cookbook: The Southern Living Community Cookbook by Sheri Castle. 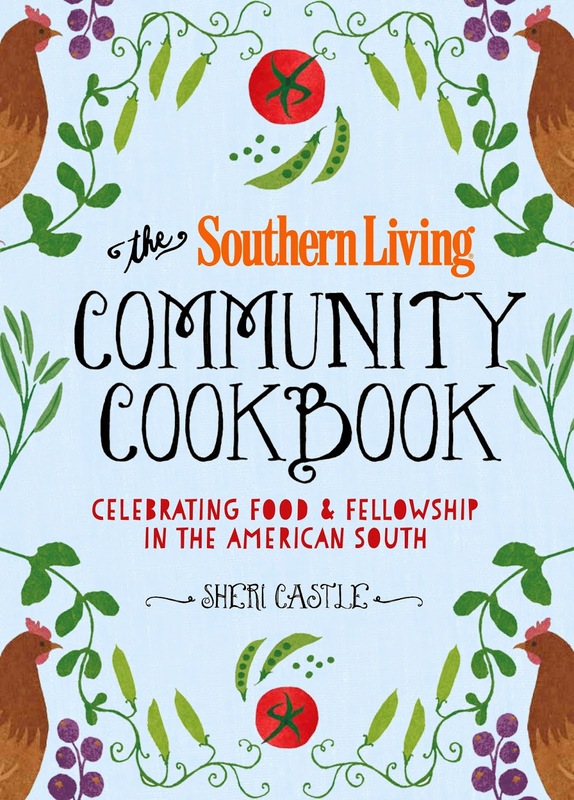 This book brings together the best hometown cooks, recipes, and stories culled from 50 years of reader-submitted recipes, as well as dishes from cherished community cookbooks and notable Southern chefs and food writers. 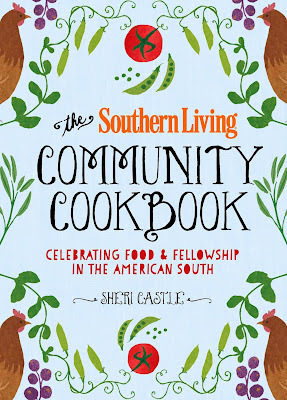 With the knowledge that a memorable Southern cookbook holds both good food and a good read, The Southern Living Community Cookbook is the equivalent of a brimming recipe box plus the scribbled notes and whispered secrets that cover the tips, advice, and stories that a generous cook shares with family members, friends, and neighbors. There are recipes I already know and love--ambrosia, banana pudding, and hummingbird cake, for example--and many I intend to test soon, like chiles rellenos squares, banana cobbler with streusel topping, and cream of peanut soup. You can't go wrong with this dish, and you can't go wrong with this cookbook. If you'd like a chance to win a copy of what is definitely one of the best and most useful cookbooks in my collection, leave a comment on this post telling me your resolution for the new year, if you even bother doing that sort of thing. I'll close the comments on December 31st and contact the winner on the very first day of 2015! Good luck! In a small-medium sauce pan, combine the brown sugar, ketchup, juices, vinegar, and soy sauce and stir. Bring mixture to a boil over medium heat. Whisk together 1 tablespoon corn starch and 1 tablespoon of water until dissolved. Add to sauce pan and stir until thickened. Reduce heat to low. Add diced chicken and remaining 2 tablespoons corn starch, salt, and pepper to a large plastic bag. Seal the bag and shake to coat chicken. Drizzle a large pan or skillet with oil over medium heat. Add the chopped pepper and saute briefly, then remove it and add the chicken; sauté until browned and cooked through. Add the peppers, pineapple chunks, and sauce and stir to coat. Serve over warm rice. A delicious dish and great giveaway! Love these wonderful old recipes, Grace. I used to make it with pork....good idea to make it lighter with chicken. Nifty cookbook! Resolutions? Hah! The same one I make every year! Lose 10 pounds! I don't make resolutions, but I love the start of a new year, it feels so fresh and inspiring! I love community cookbooks, you can find such classic gems in them. My resolution? Hmmm, I always make them at the very last minute, so for now I think I'll go with Barbara's!! Great giveaway, Grace! I want to be more active. Go to the gym 3 times a week :) Merry Christmas! I don't make new year's resolutions. But I do love community cookbooks - great giveaway. Your chicken dish looks and sounds delicious! Community cookbooks are the best; and I love all the tips and stories that go with the recipes. And being Southern only makes it better! A Perfect giveaway! My New Years resolution: to get my Achilles tendon healed and back to the gym! My New Year's Resolution is the same as last year - keep a vase of fresh flowers on my dining room table every day. I plan to take better care of myself and spend more time with the people I love. I love sweet & sour chicken! Yours looks wonderful, and your rice is nice and fluffy looking, too. New Years resolution? I'm over the "lose 10 pounds" thing. I did that last year while stressing over my husband's triple bypass and living on the chair in his hospital room. No, my resolution is to not gain it back! I don't typically make resolutions, but as always hoping to incorporate more exercise into my daily life! This looks like another GREAT Southern Living Cookbook. They don't usually disappoint. Thank you so much for sharing, Grace. I'm not one to make resolutions... You are more than welcome to link this cookbook give-away to Cookbook Wednesday! Hope you have a glorious Christmas Grace. "See" you next year!!! I would,love to,run 1000 miles in 2015! The recipe looks great, and the cookbook looks awesome! I don't generally make resolutions, but I'd like to try cutting down on sugar in 2015. Hope you had a wonderful Christmas! 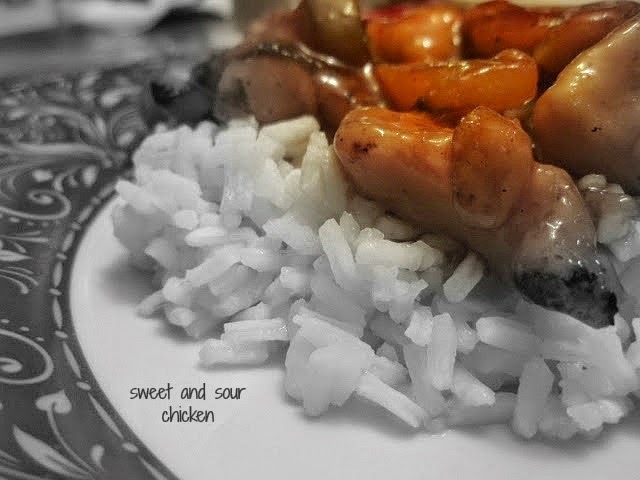 This sweet and sour chicken looks great, and I'd love to make it at home. My new year's resolution is to cook more new and different things. I want to walk and eat more Veggies and some more fruits..Happy New Year and would love to win the cookbook as it looks like a yummy cookbook, sincerely Mary Sampson from maryjanesampson@outlook.com! I love, love sweet and sour chicken! This is a great giveaway! I wish to you a very Happy and Festive New Year! This chicken looks delicious - so sticky and sweet! I am planning to make myself exercise more.... Happy New Year, Grace! Making myself happy is my resolution. Thanks for the giveaway! My resolution is to cook more and eat healthier. Not so much diet (at least not at first), but stop eating out and stop buying processed stuff.